The next revision of the iPhone OS will remove the rating prompt that users see when they delete an app from their device. The finding, noted by Arnold Kim of MacRumors, erases a behavior first implemented in iPhone 2.2, shortly after Apple opened the App Store. The initial intent of the prompt, which asked users to assign a one to five star rating for the app, was to increase the number of feedback ratings in the App Store. 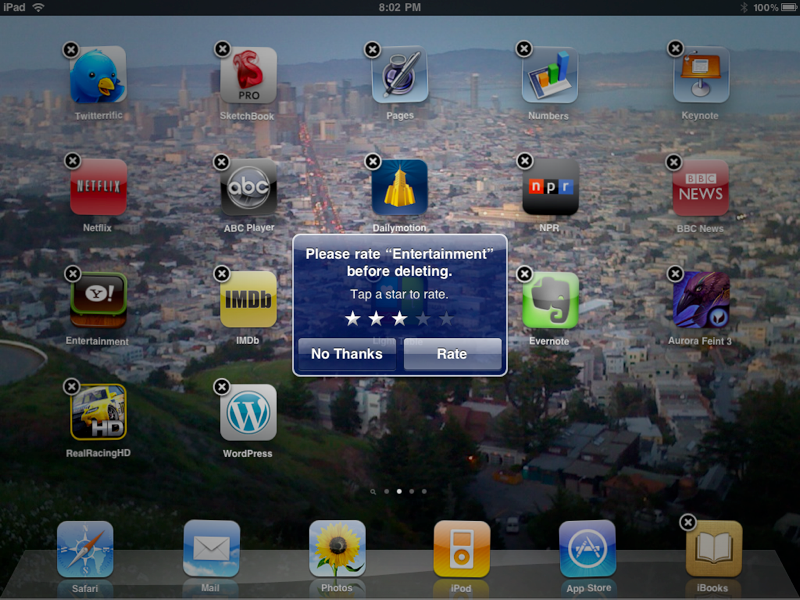 Users could also decline to rate the app (as shown below on iPad). However, developers complained that the prompt negatively skewed their ratings, as it added more low ratings from users who didn't like the app, but didn't do anything to encourage high approval ratings from those who kept the app and used it frequently. A year ago, Apple modified its ratings policies in iTunes to prevent users from entering ratings for apps unless they'd actually downloaded them. The company subsequently removed large numbers of ratings from people who had never even tried the apps they had rated. Removed ratings were often either from users protesting over pricing or, occasionally, from developers padding their reviews with positive rankings from dummy accounts. The company followed up a few weeks later by tying reviews to the revision of the app, a feature which allowed users to filter out old complaints related to problems that had since been fixed.